Presenting a visual feast as well as a culinary one, Tio Pepe is a throwback to the “good old days” of personal table service, offering delicious food in a unique atmosphere. 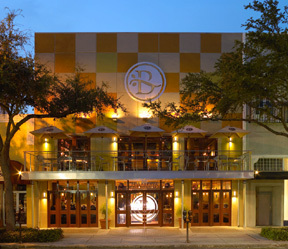 One of the Tampa Bay area’s leading, award-winning restaurants. Our perky and eager-to-please hotel attendant rattled off a dozen or so “great places” to dine when we asked for suggestions. It was our first trip to Clearwater, Florida (near Tampa and St. Petersburg), and we were interested in some local fare, NOT any of the chain restaurants we had at home! Having heard about Florida’s Cuban and Spanish cuisine, I asked her for something more local in flavor, “maybe something ethnic.” She was stumped at first, then her eyes widened in delight. “OH! There’s a China Buffet just down the feeder, with over 80 items! It’s REEALLY good!” she exclaimed. I forced a thankful smile, then scurried to the room to do some research. I scanned the yellow pages for an inspiring listing. It didn’t take long. From the outside, Tio Pepe Restaurant is fairly inconspicuous, embedded among the aforementioned chain restaurants on Gulf to Bay Boulevard, neon signs aglow. Step inside, however, and you know right away there’s nothing “chain-like” about Tio Pepe. The decor reminds one of an eccentric old lady’s living room, treasures gathered and collected over the years, with no apparent rhyme or reason. Gothic light fixtures hang in front of trellis-covered walls, adorned with masterful antique oil paintings and an enormous blue marlin trophy. We were led through an arched doorway, past a lobster tank and bakery area, to our table, which was positioned in front of a fifteen-foot tufted green leather banquette. The heavily shellacked wooden table gave off an air of formality, but the kitsch factor was too overwhelming to take seriously. Cases of wine, stacked on the floor along the walls beneath sprawling tapestries and under booths, lent an unusual sense of being in someone’s – indeed, the old lady’s – living room. Our server, Christine, a vibrant young woman from Los Angeles, was wonderful. Chatty and enthusiastic, she was just the right balance between a server who talks and lingers too long and one who is invisible. We heard all about how and why she was in Florida, but we also were given superb advice about what to eat and drink. Take my martini, for instance. Anyone who knows me, knows I am a purist. Do not pour any olive juice or vermouth in my drink! The Tio Pepe Martini is made with your choice of either Beefeater Gin or Smirnoff Vodka, and “Very Dry TIO PEPE Sherry.” Christine convinced me to try it, and at $5.25…well, anyone who knows me, knows I can’t pass up a bargain! I never knew Smirnoff tasted so smooth. The sherry was indeed very dry, adding just the perfect smooth edge to the ice cold drink without interfering with the flavor of the vodka. Christine brought an empty glass and shook and poured the drink table side, a nice touch. The garnish was perfect, two olives flanking a lemon twist (for just a hint of citrus) on one of those old-fashioned plastic spears! Old-fashioned seemed to be the theme here at Tio Pepe. Entrees come with their “famous salad tossed at the table.” Simple but delicious, the salad consisted of iceberg lettuce, delicious tomatoes, red bell pepper and olives. The well-hammered bowl, serving dishes and butter plates all were made of the same pewter-like material, adding to the “old-fashioned” ambiance. Their bread is outstanding, indeed “award-winning” and baked on the premises. Dark brown, with a crusty outside and tender inside, it was truly delicious. The entrees were straightforward and good, though lacking a little in the presentation department. My dining companion ordered the Gambas Suprema ($18.45) – five jumbo shrimp, wrapped with a piece of bacon, then lightly breaded and fried. 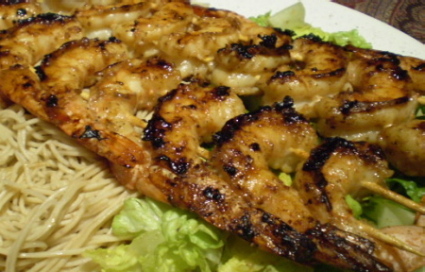 The shrimp were very large and very fresh, but were served on what amounted to a large salad plate with a small garnish of lemon. The baked potato was cut open and buttered table side, again, a nod to the “old-fashioned” service of days gone by. My entree, a house specialty, was Pompano Relleno ($21.95). Since “relleno” means “pepper,” I was curious about how that would be incorporated into the stuffing of crabmeat, lobster and shrimp. The dish came to me served on a small metal tray, the kind that sizzling entrees are served in, like fajitas. The fish wasn’t sizzling, so I found the selection of serveware odd. At any rate, what was ON the plate was delicious. 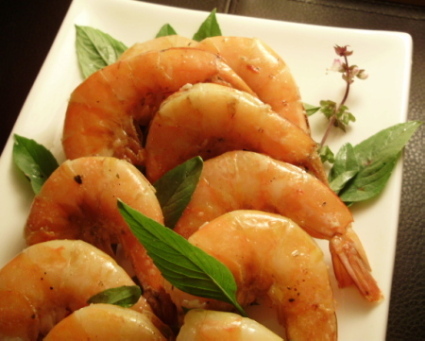 The fish was tender and fresh, the stuffing flavorful, if missing any obvious crabmeat. The “relleno” of the dish was a single strip of red bell pepper running down the center of the fish. The “burgundy” sauce was unusual, not possessing any distinct wine elements that I could taste, but it was tasty, if slightly starchy. Christine was dead-on with her wine selection for me; a Spanish Marques de Riscal white. Crisp and forceful, with a slight earthy acidity that fused well with the fish. Priced at $7.75 a glass, it was a terrific deal, and showed me that Christine was not trying to sell me the most expensive glass of wine on the list (some topped $13 a glass). Dessert was also good. We shared an apple torte, made with layers of thinly sliced apple, all inserted into a flaky, delicious crust. Again, at $4.95, a bargain. 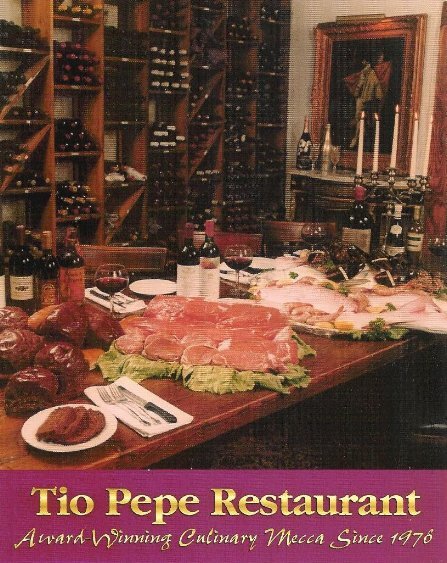 Tio Pepe’s menu boasts an impressive array of Spanish, Latin American, and Continental dishes, with an emphasis on fresh seafood and freshly cut meat – “We do not recommend well done Steaks” is prominently printed on the menu. Their wine selection is staggering, literally filling an entire book. Our Tio Pepe experience was a wonderful sensory treat. The good food and slightly bizarre ambiance made for a memorable first visit to the Clearwater area. I found the prices very reasonable, and intend to return when we visit the area again.